The 'Treasury Building' on Harbour Street was a well-known location for possibly at least a century and a half; it was demolished in 1923. This page contains most of the information I have been able to find about this interesting structure. The Treasury Building, on the south-east corner of the the crossing of Duke and Harbour Streets. 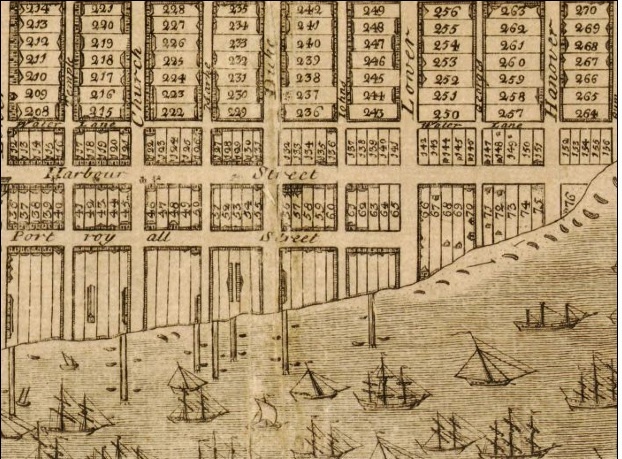 There is, however, a fine ink drawing by Pierre Eugène Simitière of the 'corner of Harbour Street and Duke Street', from about 1760. 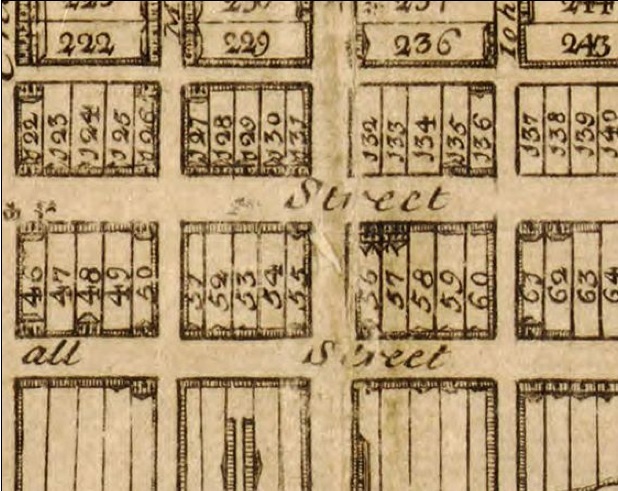 The angle of the front of a house shown on the right of the drawing would appear to be the eastern corner of the front of the building later known as the 'Treasury Building', though no name is given to it as it appears in Simitière's drawing. 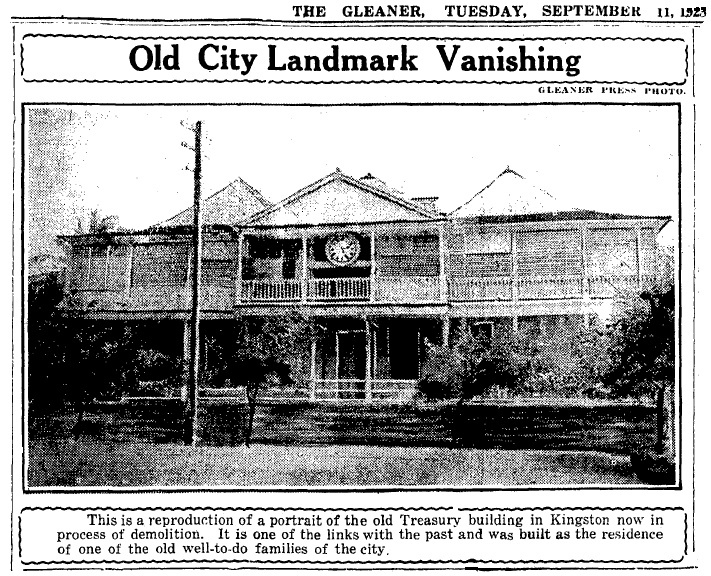 In an article based on Duperley's picture of the Court House on Harbour Street, in the Gleaner on January 15, 1913, "The Observer" suggested two earlier purposes of the 'Treasury Building'- Custom House, and Government Printery; he did not, however, have any information as to its age or origin. The picture which we publish with this article to-day was taken about seventy years ago. It represents the old Court House on an election day. You see at the western corner of Duke and Harbour Streets the building which Messrs Harvey and Bourke occupied within the memory of most of us as a law office; you see the old Post Office and Town Hall; you see the Court House, and, facing it, the old Treasury Building. At this time it was the office of the Jamaica Despatch and Jamaica Gazette, "published by authority." It had been a Government building for some time, and was probably built as such; the Custom House was there; and most likely, it was used for other Government purposes besides the Customs and Government printing. Not one of the buildings that were standing west of Duke St. remains to-day. But pass over Duke St. and you partly step into the Kingston of a hundred years ago. There are the old houses still. The old Custom House, turned Treasury and Audit Office, then destroyed by earthquake, is now a technical school in a state of disrepair, and from there eastward, with an occasional variation in the way of a modern rum-shop or Chinese grocery, hotels, ice-works, garage, and new cottages, we find places where our forefathers did business by day and planned cheating by night. They are old, and they look older than they are. They were never beautiful, and they look uglier than they ever did. They are a part of Kingston, and, so far as I can see, they are destined to remain part of Kingston for quite a long time. I'm not sure that means that the Treasury was always at the location that it was in the later 19th century, but so far I have found no source for information on the operations at the Treasury Building before about 1870. The Treasury on Harbour Street from 1703 to ca.1870 was not, apparently, the Treasury for the whole island, which it became when the capital was moved to Kingston from Spanish Town. Did it previously deal primarily with Treasury operations connected with the commercial activities carried on in the island's 'commercial' capital? shows a small gold bar on a brequet/watch chain. suggests that the Old Treasury Building had been mainly the Custom House. 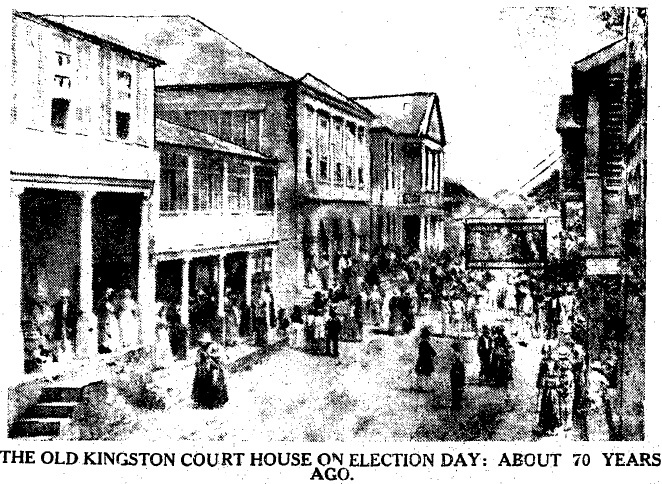 This was presumably part of the transfer of the island's capital from Spanish Town to Kingston. The long wall at the front of the Treasury was an excellent space for putting up posters advertising, one imagines, many different products, at various times - in 1902 the advertising battle was over brands of cigarettes sold by local businesses. 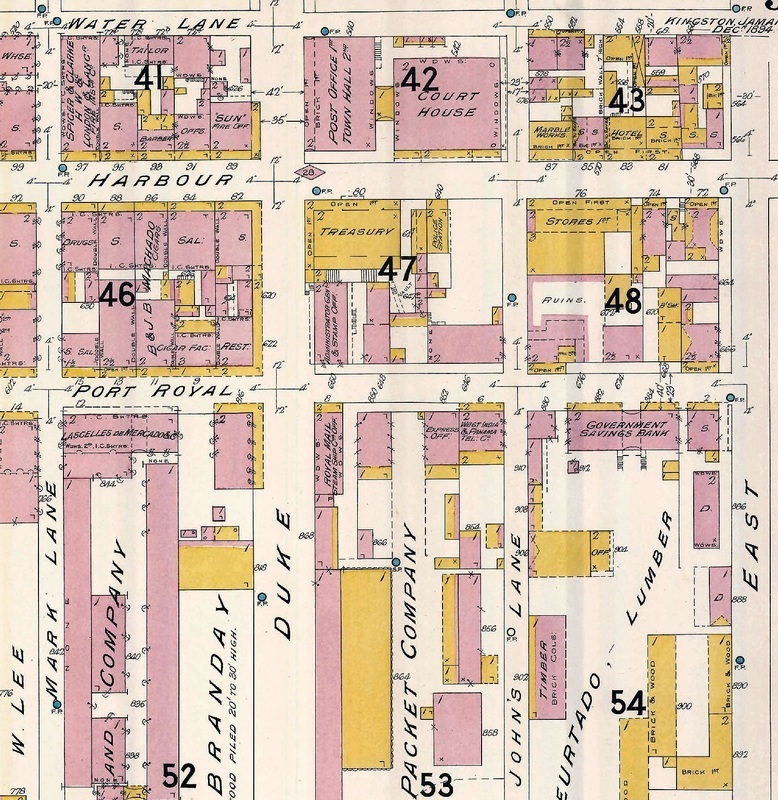 In 1904 an entertainer, Joe Chapple, leader of a visiting concert company, wrote in the Gleaner of his impressions on his visit; he mentioned plans to change the the area of public buildings on Harbour Street, which were in fact to be carried out two decades later. 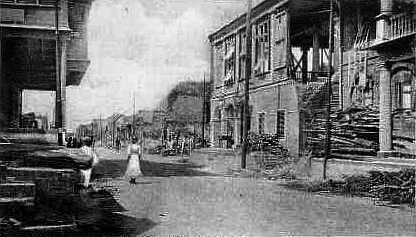 The 1907 earthquake destroyed a major part of the Hanover Street campus. 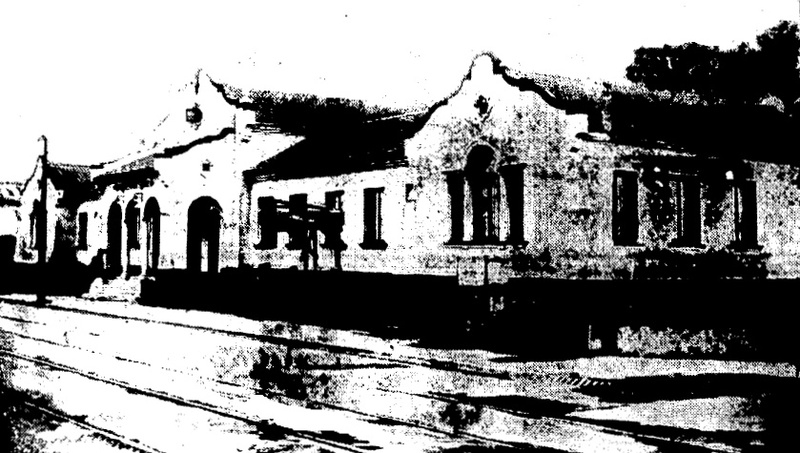 As a result, the boys department was transferred temporarily to Elletson road, site of the police barracks, while the manual training took place at the old Treasury building on Harbour Street. However in 1913, all departments relocated to 82 Hanover Street. Cleaning up after pulling down! The ceremony of laying the foundation stone and dedicating the new children's ward at the Kingston Public General Hospital, which is to be erected to the memory of the late Archbishop Nuttall, took place yesterday afternoon. Many of them would observe the improvement of the site in Harbour Street opposite the old Treasury which, not so long ago, looked like a mongoose ranch. The place had been greatly improved and it should be remembered that where unsightly conditions had been replaced by agreeable conditions interest should be taken in the improved conditions. We have noticed too that some attempt is already being made to add to the amenities the city already possesses: for example, the space upon which stood the old Treasury building in Harbour Street is to be converted into a lawn to match the lawn on the opposite side, which was the last piece of work accomplished by the late Kingston City Council, and on which that now defunct body must be heartily congratulated. We are also pleased to see that the sidewalks around the site of the old Treasury building in Harbour Street have been neatly paved by the Government . . . .
We have been informed that a handsome tourist bureau is to be constructed in Harbour Street on the site of the Treasury building wrecked in 1907. It is to be commodious, it is to have flower beds round and about it, it is to be well appointed in the way of furniture. It may be the best Bureau, from the viewpoint of appearance, to be seen anywhere in these West Indies, to be seen perhaps in any country. The new building for the Tourist Bureau is going up on Harbour Street. It is early to judge, but it looks as though here is another architectural opportunity wasted. Opinions differ as to the need for this expenditure of money; but since the building had to go up, it could have been to an attractive modern design, to impress visitors and please inhabitants. Is it? Well.....we must wait until the scaffolding comes down. 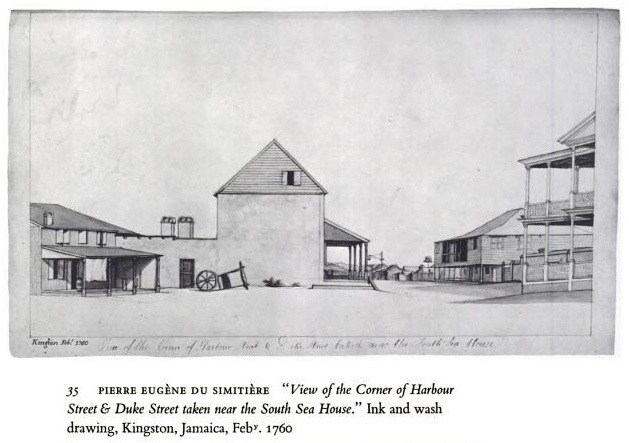 THE NEW HOME OF THE TOURIST BUREAU which the Public Works Department have erected at the south-eastern corner of Duke and Harbour Streets. The finishing touches are now being made to the building which is an imposing one. Arrangements are being made to open the building a few weeks before the tourist season which starts towards the end of next month. LATEST OF KINGSTON'S MODERN STRUCTURES: A "Gleaner" photograph of the handsome new home of the Jamaica Tourist Bureau, in the block on the southern side of Harbour Street, between Duke Street and John's Lane. The fine building was just completed and the staff of the Tourist Trade Development Board of Jamaica has already moved in to carry on their work in comfortable quarters. and for now, that's where the story ends!